Del Mar, which means by the sea, beckons to California residents, adventure seeking tourists, and outdoor-lovers with its beautiful sandy beaches, sunny weather, cool ocean breezes and exciting array of outdoor activities. 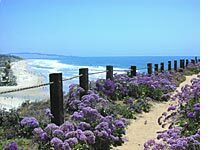 Located on the western coast of California, Del Mar is just minutes north of San Diego. As the sun shines above, the guests play below. Two beautiful sandy beaches boasting nearby child friendly seaside parks, Seagrove and Powerhouse, draw numerous residents and vacationers daily. Swimming, surfing, sailing, and sand castle building are only a few of the tempting things to do in Del Mar. Hollywood stars with an affinity for horse racing first brought the world’s attention to this charming seaside resort. In fact, the Del Mar Thoroughbred Club, famous throughout the world, is home to exciting horse races every year, during the months of July, August, and September. Inland hotels offering affordable prices are within an easy distance to fun in the sun. Beachfront hotels offering luxury amenities are within a stone’s throw to the crystal blue waters. Balconies overlooking the beach, suites the size of town homes, and luxurious spas pamper guests with accommodations fit for royalty. An attractive assortment of upscale homes interspersed on hillsides tucked in between canyons give way to awe inspiring panoramic views. Real estate in Del Mar is not cheap, but if you're thinking of relocation, these Del Mar real estate agents will help you find the best home values in the area. concerts to exhibits to games to carnival rides, each year the Fair has a central theme displayed throughout the grounds. Nationally known singers, musicians, and entertainers head the list of entertainment. Wine tasting tours are a must in the midst of nearby fantastic wineries. An historical village showcasing quaint buildings and winding streets that give it character and charm is another must see for the history buff.. Art galleries, designer boutiques, fashionable shops, gourmet restaurants, and fine dining establishments with an ocean view provide hours of pleasurable moments. Lovingly sandwiched between San Dieguito River to the north and the Torres State Park to the south, Del Mar has an amazing capacity for beauty and enjoyment. Attractions, great climate and recreation by the sea is a perfect reason to visit Del Mar CA. You'll never want to leave.